Bring a few well chosen accessories with you on your honeymoon and you’ll treasure them for years to come. The memories of using them will fill you with happiness every time you pull them out. With exquisite details including leather trim and gold plated hardware these bags are my adored picks for such an occasion. 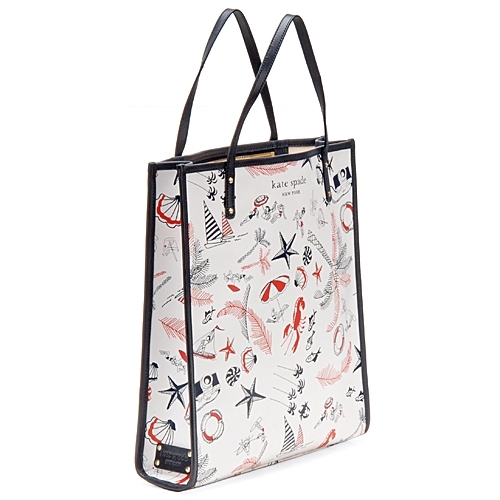 I love the whimsical beach inspired print on this coated canvas au revoir griffen tote from Kate Spade. You can fill this generously sized tote with beach necessities or browse the local seaside markets. Looking at this makes me want to slide into a pair of flip-flops and hit the beach! 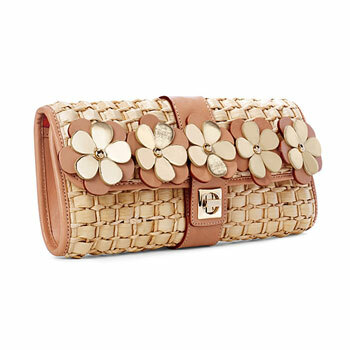 Switch gears to evening with the cinnamon bay ava clutch also by Kate Spade. How adorable are the little gold flowers dressed up with a gold plated latch and a tidy cornhusk straw woven body? A really sweet and chic way to accessorize the dinners on your honeymoon! I’m also thinking this would be a really sweet and chic way to accessorize my summer! I love handbags, especially by Kate Spade! What are some of your favorites you’ll be carrying this summer?